Last week was going through some photos from last winter. 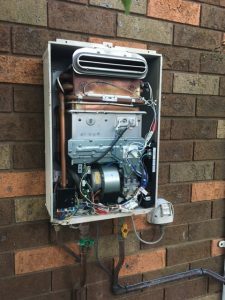 We were called out to a hydronic heating repair in Dee why. 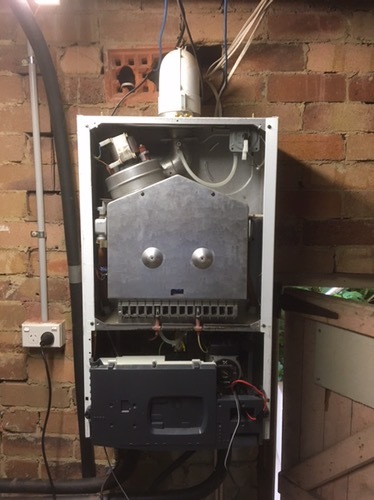 Our clients Baxi Boiler had gone out and we needed to get it working. The Baxi boiler was running a full radiator system through the house with over 10 radiators. After checking out the components on the boiler like the fan, pump, air pressure switch, venturi and gas valve. We worked out that the PCB (main electronic control board) was appearing to be faulty. After changing the PCB the unit was fired up and all working. After the boiler was fired up we carried out a full check on the radiator system checking all valves including thermostatic radiator valves and expansion within the system plus programmer and thermostat. We were called out for a leaking hot water system in north Narrabeen which we repaired yesterday. After our initial inspection we found that the temperature pressure relief valve had failed and was leaking continuously. 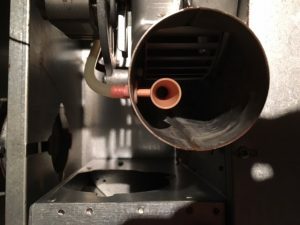 As the heater was 7 years old we offered a complete service on the unit and replaced the temperature pressure relief valve and the sacrificial anode. The temperature pressure relief valve is a safety valve on the heater which should be replaced every 5 years. It protects the unit from over pressurisation and over temperature by relieving water from the tank. It most often does its job during the heating cycle of your heater. Rheem states it is acceptable to leak 1 bucket of water per day from the temperature pressure relief valve. Replacing the sacrificial anode well that can double to triple the life of your heater. A little something extra we also just double checked the water pressure at the house and identified that our client had 1400kpa water pressure. As the Australian standard of plumbing states you should only have 500kpa we quoted for a pressure limiting valve at the water meter. Our client said to us straight away “is that why I have to replace so many washers”. Everything now made a little more sense as to wear and tear of the tapware. Check out our photo of the sacrificial anodes. Old and new. Below! Is your hot water heater leaking ? Have you been putting off getting a checkup ? What a week after those storms hey ? 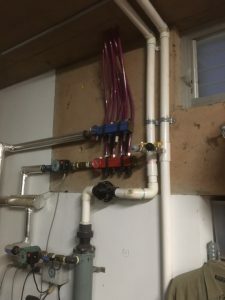 We carried out a hot water Installation in terry hills after a basement flooded and destroyed the existing hot water system. The storms certainly did more then just whip up the ocean and the Collaroy beachfront. Our phone has been ringing off the hook with hot water outages! With the Terry Hills job Our client lived on a hill with her hot water in the basement under the house. During the storms her pump in the basement failed and the whole area flooded. Everything in the basement was ruined. After taking the call our client advised us that the job was an insurance claim. She required a full report on the old heater so as to claim through her insurance. We provided her with a report and replacement on the same day so as she could speed up her claim through her insurance company. Check out the photos and you can see how the area would have flooded during the storms. The brick wall apparently just made the whole area like one big bath. The new heater was fitted with a new Duo valve, Pressure limiting valve and Tempering valve. We can work with you to help you get your insurance claims through when situations like this arise. 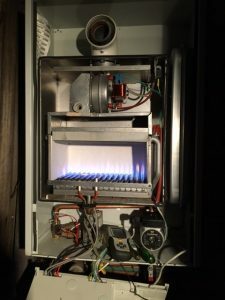 Full hot water reports are no problem. Does your hot water heater need a check ? Is it in a basement ? We also check your pumps for you and can make recommendations to protect you and your belongings in the future! Here is one I have described earlier. 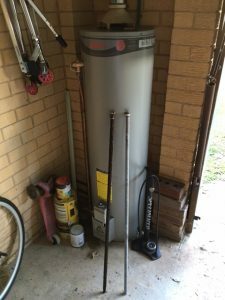 We serviced this Rinnai hot water heater in Collaroy and again checked the usual. Water filters cleaned out and gas pressure both standing pressure and working pressure. 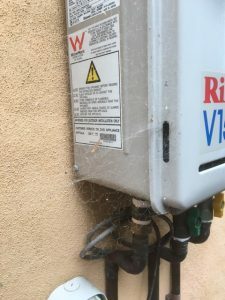 The reason why i wanted to bring this one to your attention is because in many blogs before this one I have described how we also clean out the inside of the Rinnai unit from spiders and webs and anything else searching for bursts of warmth as you have your shower in the morning. See the photo ? Nothing like a real life Scenario of what we describe what we come across. Just so you know this is a mild amount of webs. Some of the places people have their hot water heaters installed still amazes me how the installer deemed the location as “accessible for servicing” as the manufacturer requires it to be. Anyway the access to this heater was fine but I just thought I would show an example of the spiders. When the unit was opened they were having a little party. All over the gas valve and wires and Electronic control board. We isolated the power and cleaned out all the webs and gave the unit a good once over. 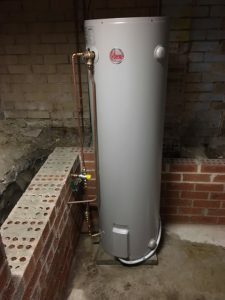 Do you have a Hot water heater in a strange location ? Would you like us to come and service your hot water heater ? Regular Service of your hot water gets longer life out of your Unit !! 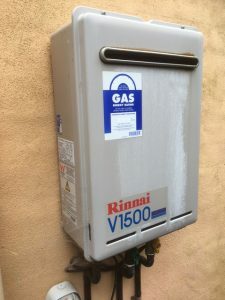 This little Rinnai in Brookvale gets serviced every year. After carrying out an annual check on this unit where we check the water filters. The gas pressure both standing and working. We also removed and cleaned the electrode to ensure it sparks for ignition. Remove any foreign matter that is inside the casing (we often find spiders in there). Lets talk about the 2 main checks we do. 1st is Water filter. Firstly if you do not have enough flow through the unit then it will not ignite. So by removing foreign matter from the filter we are freeing up the water flow and keeping everything clean to ensure we always get ignition. Standing pressure. Checking the gas pressure at the unit while it is not running now this should always be fine. if its not fine then we are searching out your gas meter and checking the regulator at the gas meter is not faulty and in need of replacement. Working pressure. Now we run the unit and check the pressure with the unit operational. 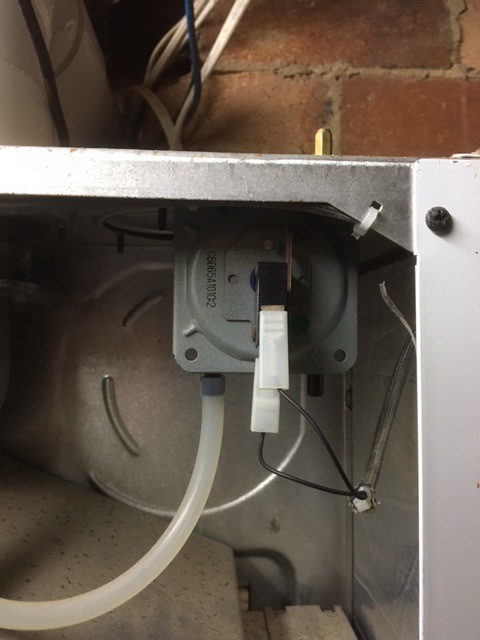 Again this should be fine but if it is not then we are going to be double checking again the regulator at the gas meter but also the gas pipe sizing and amount of appliances connected to your gas. How does your hot water feel ? Would you like to be put onto our regular service schedule ? Here we go again we just love Hot water ! 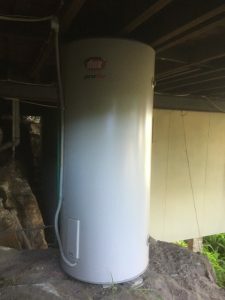 Called out for a repair in Beacon hill and found this DUX Hot water heater under the house on a rock. As you can see in the photo the heater has just been slapped in with a few tiles to level it out on the bottom of the heater there !! We found on this unit that the thermostat was tripping out due to a faulty element. The Client decided to Replace both the thermostat and the element. We also replaced the temperature pressure relief valve. Before swapping your hot water heater call us ! Don’t get quotes over the phone get somebody to come to site and look at what you have. 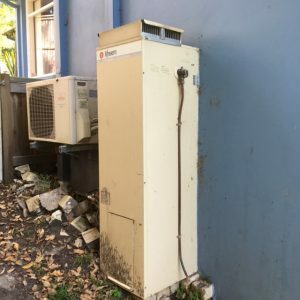 The location of your heater is very important and you need to consider servicing in the future. 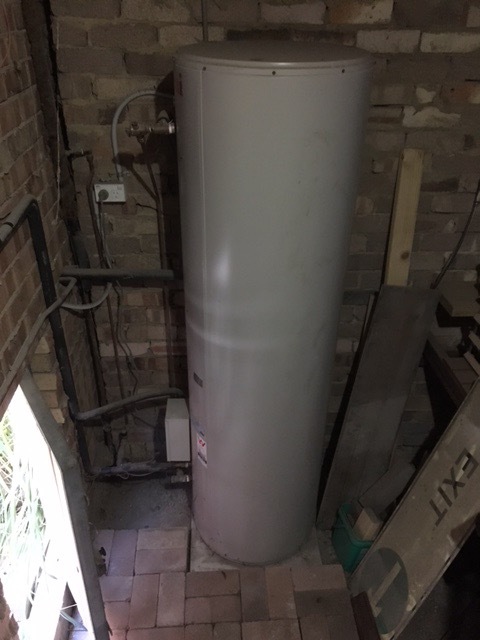 Why spend all that money on a new hot water heater or call around trying to get the “cheapest quote” to then have a heater like this which will not have any chance of lasting a longer life due to inadequate access. Not to mention the old heater not being taken away from site. Want a quote for a new heater ? Site inspections are a NECESSITY !! Loving the work in my home suburb. This little hot water repair in Elanora heights was a 27year old heater. Man they don’t make them like they use to! We found the Thermocouple had lived its last days and now failed. Since we carry thermocouples in stock we had this replaced and the unit was up and running again in no time. A quote for a replacement has been given to our client so that when the heater finally goes we will arrive with the right heater to make for a faster replacement when required. As you can see by the picture the heater is secured to the wall on a concrete pad for support. But did you notice on the right hand side look at the Temperature pressure relief valve and copper pipe running from the valve to the ground. The Temperature pressure relief valve releases excess pressure and heat from the heater. Can you see how it is also eroding the soil which is supporting the heater ? 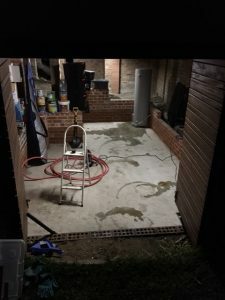 This matter has been noted to our client and when the heater is swapped out we will be running the line further away from the current location and providing some added support for the existing concrete pad. 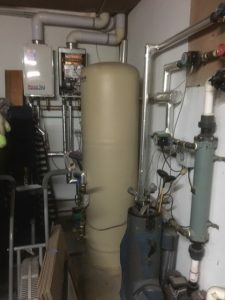 Do you have an old hot water heater ? Would you like for us to put a quote on OUR system of what you need to replace it ? When you call to replace your heater we can arrive with all the gear needed for an Instant replacement ! What a great little job close to home. This hydronic system was in need of repair last night. We received a call from our client in the morning and booked them in same day for the repair. 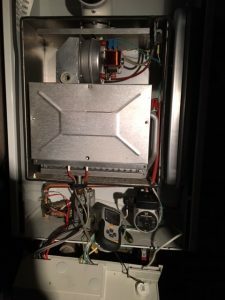 We found the Rinnai unit on the right not to be firing. After running a few checks on the unit the fault was rectified and the unit fired up and purred along. While on site we made sure we cleaned out the filters on the units and gave them a look over for our client. This system was quite old but would have been extremely advanced for its time when installed 7 years ago. The system was a solar system with a buffer tank. The buffer tank was being heated up firstly by the solar. 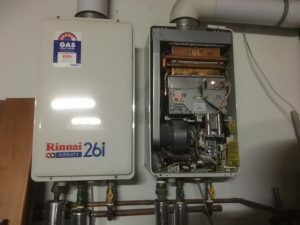 Once there was no more gain for the solar it then went to the Rinnai on the right to heat up the rest of the tank. The heated water in the tank then provided the heat for the underfloor heating and pool through a coil (indirectly) within the tank. The actual tank water was then used to pass through the rinnai on the left which then would only turn on and heat up the water should it have been under 50 degrees. Smart little system huh. 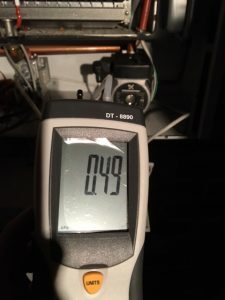 Hydronic heating gone down ? Feeling cold ? 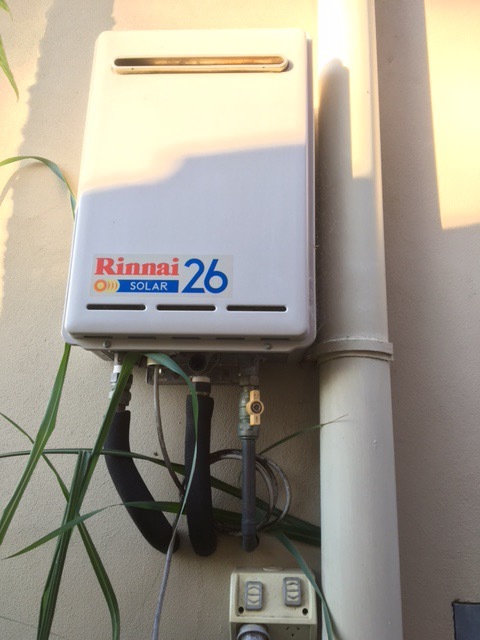 This Rinnai solar hot water system needed some repairs. The system was a flat panel split system with a gas instantenous back up hot water unit. These are the most efficient systems when it comes to solar. Our client advised us he noticed the gas backup was running more then normal. After close inspection of the unit we found the pump had seized and the client was not getting any energy from the flat solar panels into the tank the pump was replaced and system tested all fine. Interested in solar ? 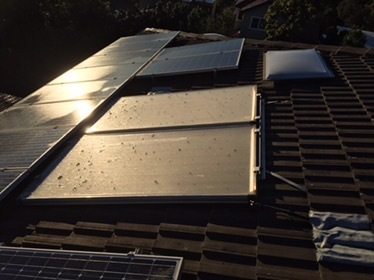 Solar comes with government grants. Ask us how. Does your hydronic heating need attention ? 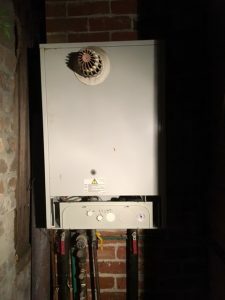 Winter is coming and one of our clients in Clontarf needed a repair to their boiler this week. This Baxi Luna 3 comfort was showing error code e03. We found the fan proving switch to be faulty. After an extended summer of sitting idle the switch was stuck in the closed position. The part was serviced and the boiler is now fully operational. We have provided our client with a quote to replace the part so should it happen again or if they would like to take action before it does happen again we will be able to get a new part in straight away. We keep all boiler details from boilers we service on our system. When your boiler goes down we can pull up our records (mainly photos) to know exactly what we are coming to see ! I love this heating system. Check out the prehistoric underfloor heating manifold! 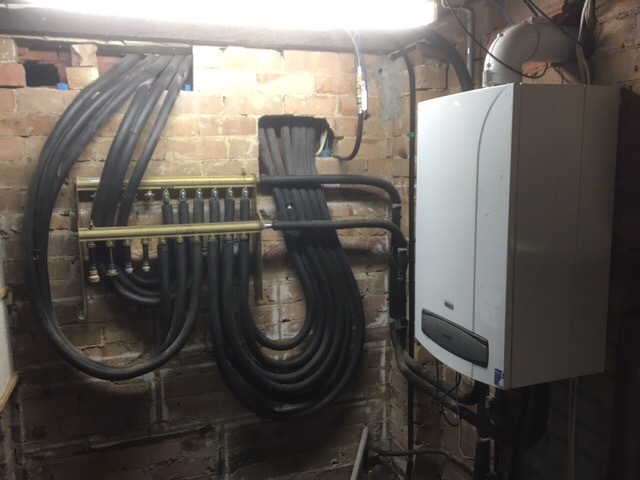 The thing about hydronic heating in sydney is you very rarely see the same system designed twice (especially the older systems). We do not have a set way here of doing things because Hydronic heating is not a necessity it is a luxury. Basically each individual company who installs hydronic systems comes up with “their way of installing” and no 2 companies do the same thing! But don’t you worry. We love a challenge and with the 8 years of European experience and support network we have we can solve any problem. Lastly a Big Big HUGE thankyou to Carly for leaving such a nice review on Google for us after we completed this fix for her. Feeling cold ? Does your hydronic heating need looking at ? We have over 10 years experience in hydronic heating! Monday - Friday between 7am and 7pm.